They call him ALA. Pronounced just like the God of our Muslim friends, he’s the Lord of Cebu Boxing. 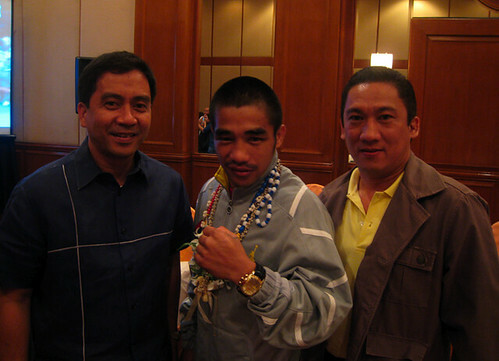 He hails from Iloilo, studied in La Salle Bacolod, built his business empire in Cebu, transformed it into a Philippine conglomerate and, when we speak of the sport named Boxing, he’s conquered Earth. Antonio Lopez Aldeguer. Is there a sportsman more befitting the title, “Cebuano Great?” He is. Over a span of two decades or more, he has developed and housed and nurtured dozens, hundreds, thousands of athletes with red gloves on their bare knuckles. Talk about sports tourism? He has done more for Cebu than any other. Last Sunday’s World Cup? Mexico versus Philippines? That wasn’t Mexico vs. RP. That was Mexico versus….. Cebu! For except for Diosdado Gabi, weren’t all the five ring artists sculptured here in our hometown? Boxing is at its peak today. No less than Oscar de la Hoya is flying to Malacañang—and maybe, to Cebu—to pay homage. Thanks to one man whose passion, generosity, vision and selflessness are as rib-breaking as that left hook of Gerry Penalosa. ALA, as we stand and applaud, take a bow. Last Wednesday night at 9:30, I sat inside the Cebu City Marriot Hotel ballroom. Cameras clicked. Handshakes exchanged. Newspaper reporters scribbled. Cebu TV Channel 28 videotaped. BOOM-BOOM. He looked fine. His face clean and free of any beating. For if there’s any positive taken from his crumbling to the floor 2.5 minutes in the first round, it’s this: No physical damage done. MICHAEL ALDEGUER. Jet-lagged and sleepless from L.A. to Guam to Manila to Cebu, he never lost the passion when he addressed the crowd. Before saying his piece, Michael asked the whole ballroom crowd to accord a standing ovation to the boxers. What a fitting gesture. “We have shown that the Philippines is at par with the best in the world,” Michael then said. He spoke of Boom-Boom. Of his fighting spirit. That despite being hit, he stood up, didn’t run and faced the enemy. That, he said, showed his courage.